The task consists of two pages: Task page, and Review page, which can be switched by clicking the tabs on the bottom. The toolbar does not change when switching the pages. Task status: The toolbar displays the task number and the status. Use the drop-down menu, and save to change the status. Link to artifact: A link in the toolbar now allows opening the artifact that you are working on directly from the toolbar. For example, if you are working on a reference set, click on the link to open the reference set editor. There is no link for General Authoring tasks. Synchronize incoming changes. Updates the local copy of the task to reflect any changes on the server. Activate: Click on the icon to activate/inactivate your task. 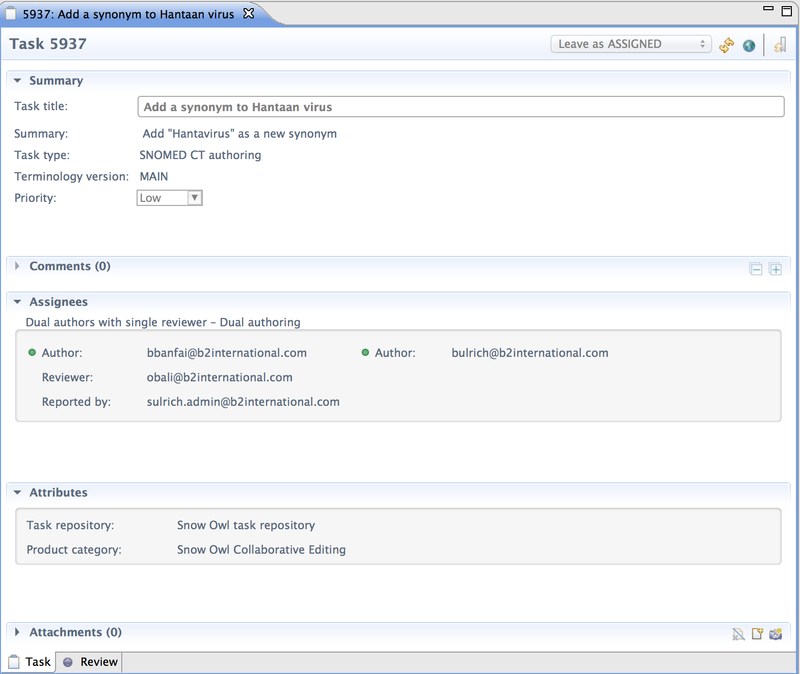 A frame around the circle indicates that the task is activated (see screenshot). Activating a submitted task will initiate the workflow. Promote: Use this button to promote changes to the main repository. This button is only enabled if the task has been reviewed. Note: It's no longer necessary to submit changes manually, they are submitted automatically when saving. For this reason the submit button was removed from the UI. The task page displays information about the task. It can also be used to modify existing content. Summary: Displays the task name, task summary and task type (e.g. 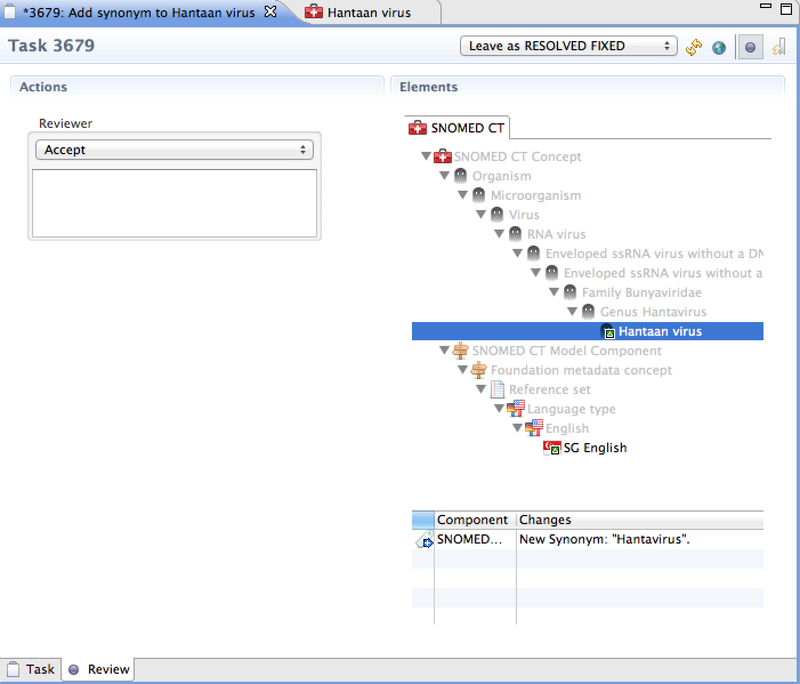 SNOMED CT reference set authoring), and the terminology version. You can also set the priority status in this section. Comments: Use this section to add new comments about the task and view all previous comments. Comments you have read previously are folded. You can expand and re-read individual comments or click the "+" at the top right to expand all comments. The name of the person writing the comment will be displayed. This way, you can see which team member wrote a comment. Assignees: Shows the team members that are involved in this task (e.g. Author, Reviewer). A green circle indicates the team member that is currently assigned to the task. Attributes: Shows the task repository, and the product category. Attachments: Files can be attached here, for more information see Attachments section. The review page displays changes that were made while the task was active. Different layouts support the selected scenario (e.g. number of authors and reviewers) and artifact type (e.g. 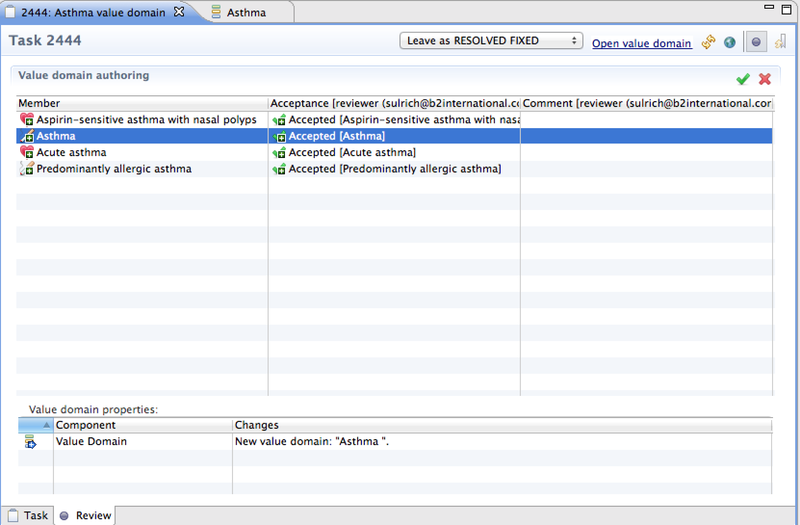 SNOMED CT authoring, reference set authoring). See Use cases for more detailed information. It displays the relevant parts of the concept hierarchy: If a concept, or any component associated with it has changed, it is added to the context with its parentage. If you click on a concept, you can see the types of modifications on the list below the tree (see screenshot). The icons associated with the changed concepts have a small decorator indicating if they have been added, changed, or deleted/inactivated. If a reference set was edited, the modifications appear in the same SNOMED CT hierarchy, attached to the reference set identifier concept. You can also open the concept editor by double-clicking on a concept. The same functionalities apply to ATC and LOINC authoring. 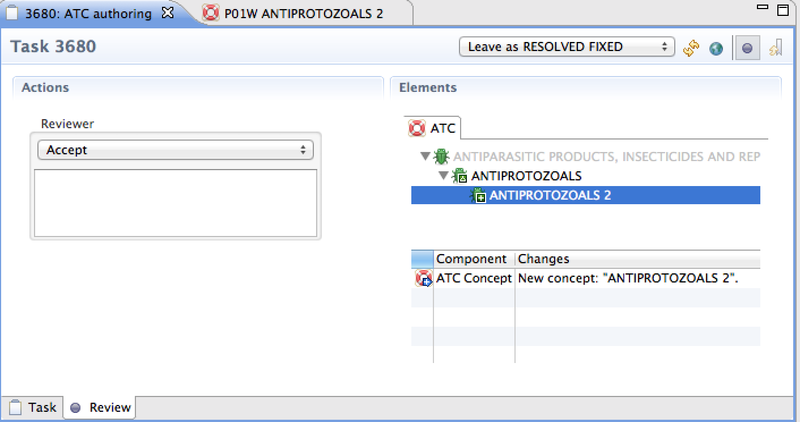 Changes made in ATC are displayed as a tree. 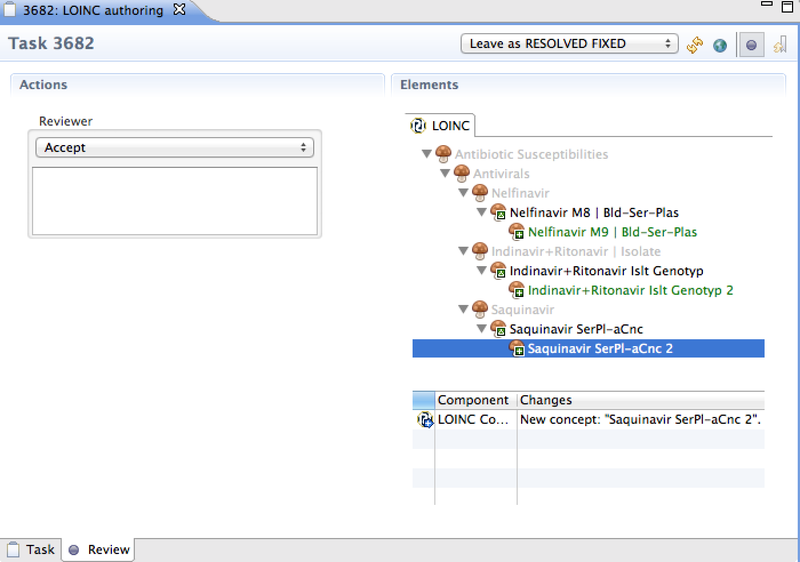 Changes made in LOINC can be reviewed as a tree. The Attachments section of the task editor allows you to upload and access files. Uploading an attachment will make a file available to anyone who has access to a task. This way files (e.g. documents, photos, screenshots) related to the task can be shared with team members. The table shows the files that were attached to a task as well as additional information (file name, description, file size, person who uploaded the attachment, date of the upload). 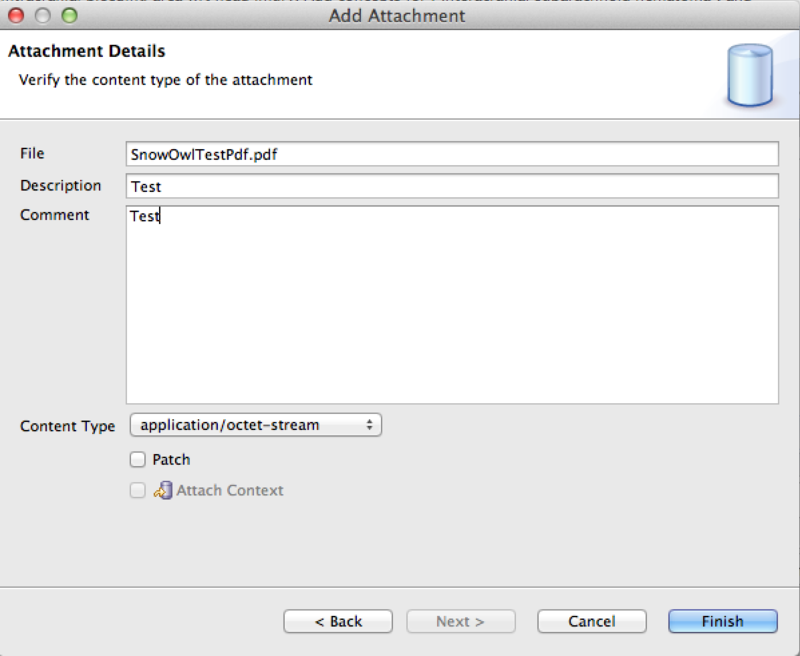 To''' open an attachment''', double-click on the file name in the task editor. 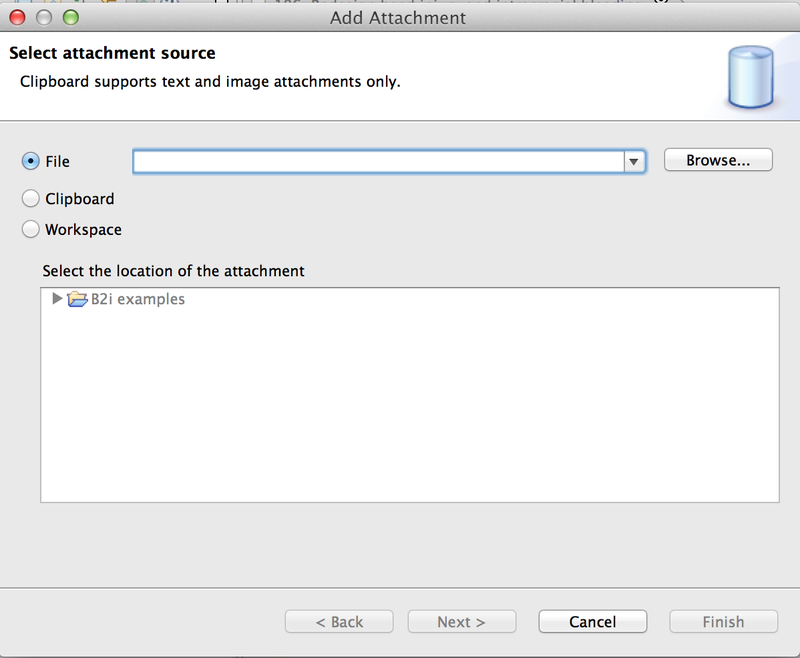 If you wish to open your attachment in a non default editor, right click on the item and select 'Open With...'. If the Snow Owl client is behind a proxy server, then opening the attachment will first open an embedded web browser within Snow Owl, and will ask you to authenticate to bugzilla. After successful authentication attachment opening works as expected. Click the "Attach..." button to open the wizard. There is also a toolbar icon on the right side of the section that invokes the wizard. When you attach a file, a copy of the file will be uploaded to the shared repository. File: Uploads a file from your system. Click "Browse" on the right to select the file. Clipboard: Uploads the latest data that were stored on the clipboard. You are probably familiar with the clipboard, which is used for data transfer between documents via copy-paste operations. Workspace: Uploads a file from your workspace. Select the file from the box below. Click Next to preview your file. If your file is an image, a preview of the file will appear. Click Next to proceed to enter the Attachment details. File: The name of the uploaded file will be automatically used here, but you can enter a different file name. If the upload fails (e.g. file size is too large), we recommend to hit Cancel and start the process again. You can also use the navigation button to go back and pick a new file for the upload. In this case, the system will re-use the previous file name (and not the one of the new file), and you have to manually adjust the new file name so that it matches with the uploaded file. Description: Provide a brief description of the file. This description will appear in the attachment list in the task editor. Comment: Provide a comment about the file. This comment will appear in the comments section of the task editor. Content Type: A content type for the file is automatically set. Click Finish to upload the file to the task repository. Please keep in mind that once an attachment has been uploaded it can not be deleted from the task management system anymore. Even attachments that are set as obsolete can still be accessed. To avoid mistakes, make sure you picked the correct file before uploading an attachment. 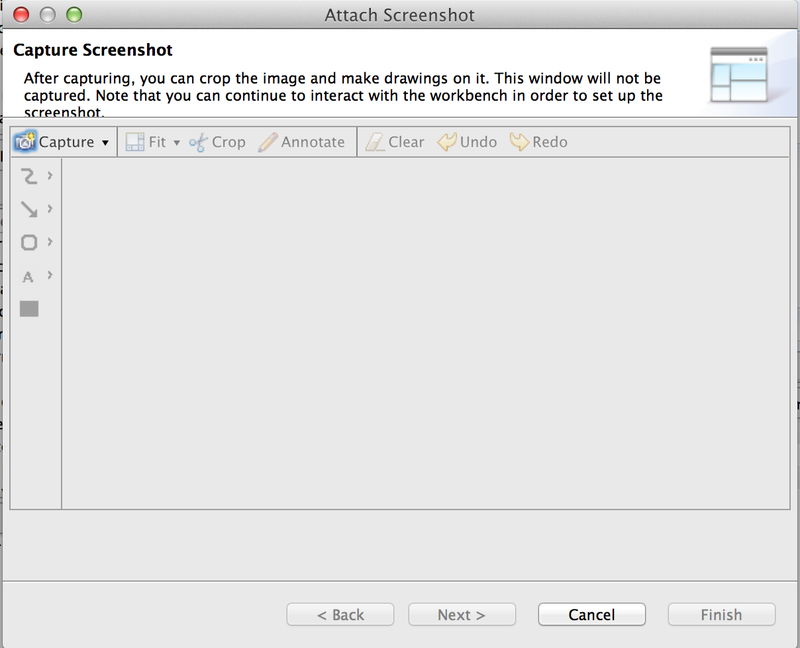 After the upload, you need to synchronize the task editor to see your attachment. Whenever an attachment is uploaded, a entry is made in the Comments section with a link to the attachment. 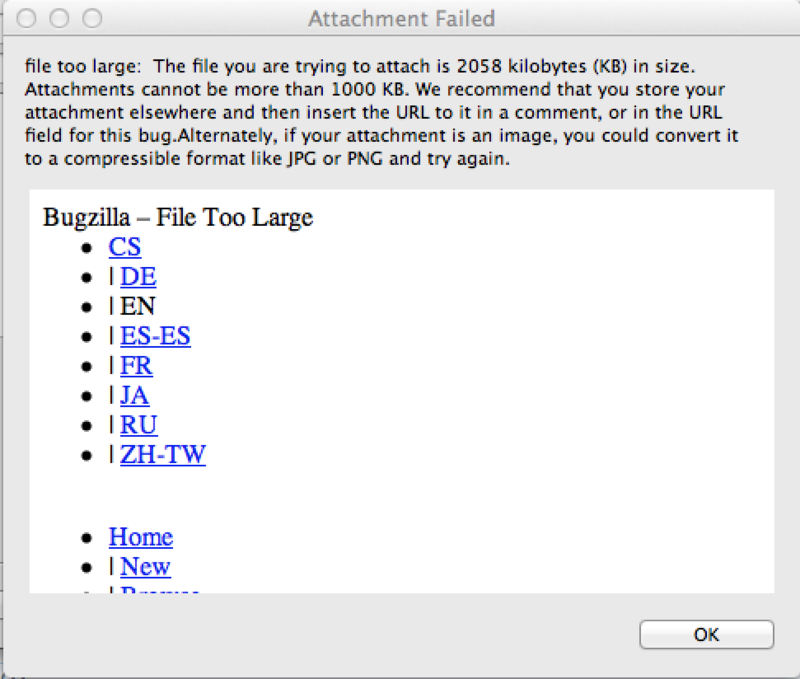 Attachments cannot be larger than 1000KB. For larger files, we recommend to store your attachment elsewhere and then insert the URL in the comment field, or in the URL field. If your attachment is an image, you could convert it to a compressible format like JPG or PNG. If you want to attach a screenshot to your task, use the Attach screenshot button in the toolbar of the Attachments section to invoke the wizard. Desktop (delayed): Allows you to set a timer for your screenshot. After capturing, you can edit the picture (e.g. cropping, drawing arrows) by using the icons. Once you are done editing, hit Next to review your attachment. 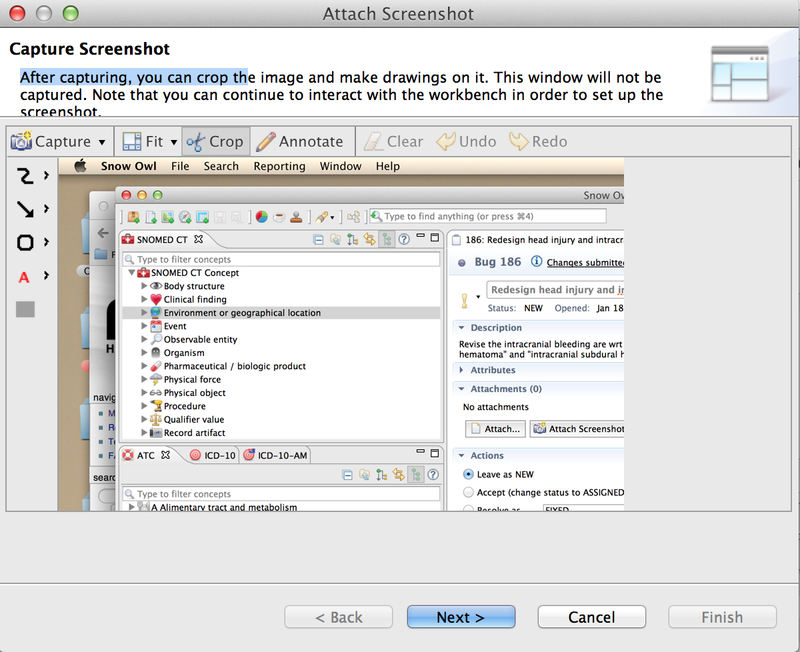 If you are happy with your screenshot, hit Next to specify the attachment details. For further information about the attachment details please refer to the previous section. Hit Finish to upload the screenshot. If an attachment is no longer needed for a task, you can mark it as obsolete by right-clicking the attachment, and choosing Mark As > Mark Obsolete. The font color will change from black to grey, indicating that the attachment is no longer in use. It's not possible to delete an attachment. You can revoke the setting of obsolete attachments by choosing Mark As > Mark not obsolete. Use the toggle button in the toolbar button to hide/show obsolete attachments.